Part four of a series of five posts on recommended items (as requested by Makeup Bootclass students). See here for the first in the series. 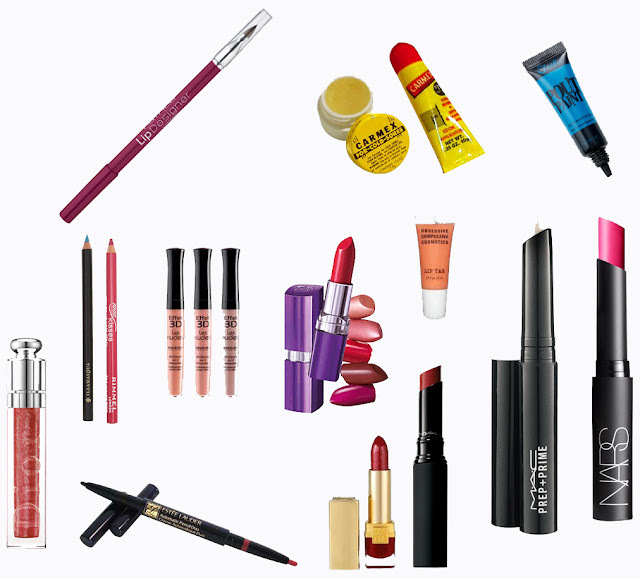 This post covers "lip" items (ie primer, lip pencils, lipstick, lipgloss, lip stains). It's a good idea to use a lip primer underneath your lipstick - put it on while you're doing your base, and then when you are ready to do your lipstick, either remove it or blot it away. It will make your lips nice and soft and ready for lipstick, which is especially important if you're wearing a strong lip colour, because you can't get away with chapped lips in this instance. A lip pencil can be used all over your lip to give a good base for your lipstick, help stop stronger colours from bleeding, help your lipstick last longer and wear better, help define your lips, especially if they're a little small or thin. There are lots of different types, ranges, formulations, finishes. You can spend a fortune on lipstick, but you really don't need to; if you apply it over a primer and liner, and blot and reapply one or two times, you'll get as much wear out of a cheaper lipstick as you will a more expensive one.